Mexico’s foreign relations secretary says his government is evaluating its cooperation with the United States, following President Donald Trump’s deployment of National Guard troops to the border. But McMaster says his offer Monday afternoon to Republican Texas Gov. Greg Abbott was just one state helping another, like other states have helped South Carolina after hurricanes. South Carolina Adjutant General Robert Livingston says details including how many troops the state will send, their duties and how long they will stay will have to be worked out. McMaster says he plans to make a similar offer to Arizona’s Republican governor. The Republican governor in a statement reiterated her support for sending troops to the southwestern border to combat illegal immigration and drug trafficking, saying the operation would ultimately make New Mexico safer. Texas Gov. Greg Abbott says his state will commit at least 1,000 National Guard troops to the Mexico border in response to President Donald Trump’s call. 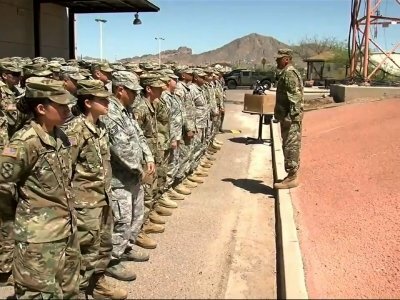 Arizona has boosted the number of National Guard troops it will send to the Mexico border to 338 from 225 as part of President Donald Trump’s plan for having the military help fight illegal immigration and drug trafficking. The Arizona National Guard said in statement that 225 troops will be deployed to the border Monday and another 113 on Tuesday. The statement came after Arizona Gov. Doug Ducey announced that more troops would be sent Tuesday but did not specify how many. Arizona’s governor has cited a “surge” of border crossings in March as one of the reasons for his decision to send members of the state’s National Guard to the U.S. Mexico border to help fight illegal immigration and drug trafficking. The Republican Doug Ducey made the comments Monday after he saw off some of the 250 troops that Arizona is sending in response to President Donald Trump’s plan to send up to 4,000 troops to the border. But the state’s National guard did not return phone and email messages Monday seeking comment on how many have arrived. The Texas National Guard had said Friday that 250 of its members would be deployed to the border within three days as part of President Donald Trump’s plan to fight illegal immigration with up to 4,000 National Guard members. New Mexico has not yet deployed any National Guard members to the U.S.-Mexico border in response to President Donald Trump’s call to use troops to fight illegal immigration and drug trafficking. It’s not clear when they will head to the border. California has not decided whether to send National Guard members to the border with Mexico to help President Donald Trump’s deployment of troops to fight illegal immigration and drug trafficking. That’s according to Gov. Jerry Brown’s spokesman Evan Westrup. He said Monday that Trump’s call is still under review. Brown is a Democrat and hasn’t spoken publicly about the request. New Mexico’s Republican governor says her state will participate as well. They will also help with construction of border infrastructure to free up federal agents’ time so they can concentrate on border enforcement. Arizona Gov. Doug Ducey says 225 members of the state’s National Guard are heading to the U.S.-Mexico border to support President Donald Trump’s call for troops to fight drug trafficking and illegal immigration. The Republican Ducey in a tweet Monday said more of the state’s Guard members will be deployed on Tuesday. Corrects in 1st item that Arizona troops being sent Monday and Tuesday not Tuesday and Wednesday.